GrAMPA is based on the generalized approximate message passing (GAMP) algorithm, a powerful Bayesian framework for large-scale generalized-linear inference exploiting a separable signal prior, a separable likelihood, and a sufficiently large, dense, linear transform. To get started using GAMP, download the latest GAMPmatlab release. You can find some introductory examples described on the wikia site as well as intructions on how to get the latest development code. The workhorse of GAMPmatlab is the gampEst function. To implement GrAMPA, we need to specify its four input arguments: the signal prior GrampaEstimIn, the measurement likelihood GrampaEstimOut, the linear transform GrampaLinTrans, and the algorithmic options GrampaOptions. % When using GAMP to implement GrAMPA, we recommend the following options. % we can simply stack the matrices, but in general we'd use *LinTransConcat()*. % which in this example is ensured by the way that we built the operators. % a parameter *omega*. Below, we guess the value *omega*=3. % resulting normalized output SNR. 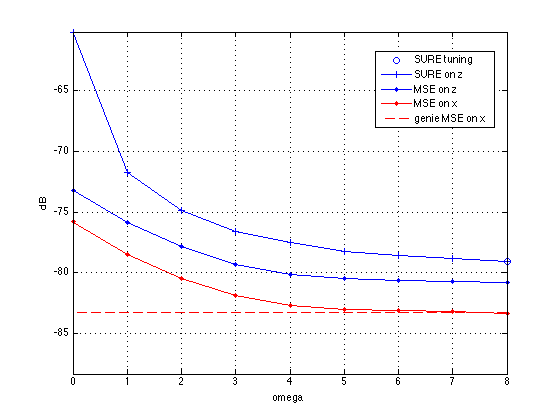 Now let's see if we can improve performance by (genie) tuning the SNIPEstim parameter omega using Stein's Unbiased Risk Estimate (SURE) computed from the GAMP analysis outputs, which should be AWGN corrupted versions of true analysis outputs with known noise variance. We will also compute the true signal MSE to verify that SURE is working as expected.